Are all your pieces One of a Kind? Answer: YES. All my saggar fired vessels are created from raw porcelain clay. I 'throw' each piece on the potter's wheel, creating the form and preparing the surface for the polishing. 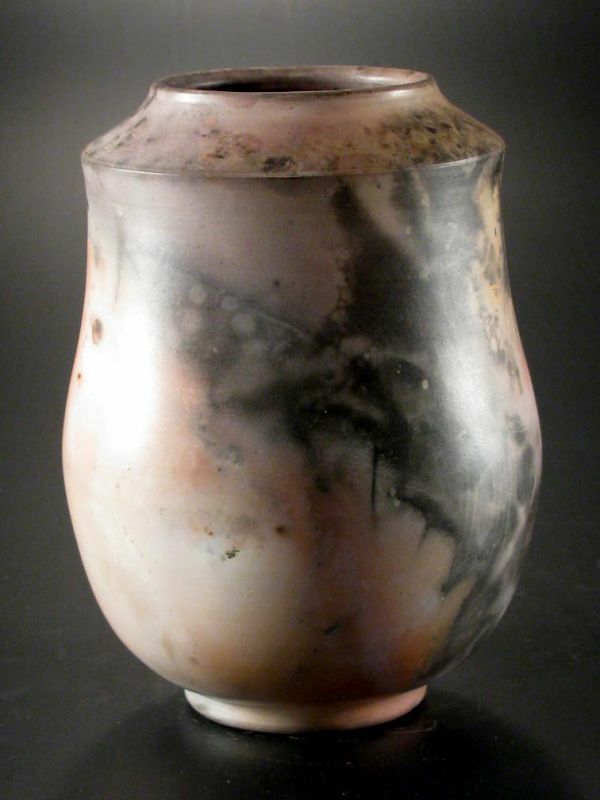 A few days later, I trim each vessel to complete the form and I hand burnish it with a river stone. 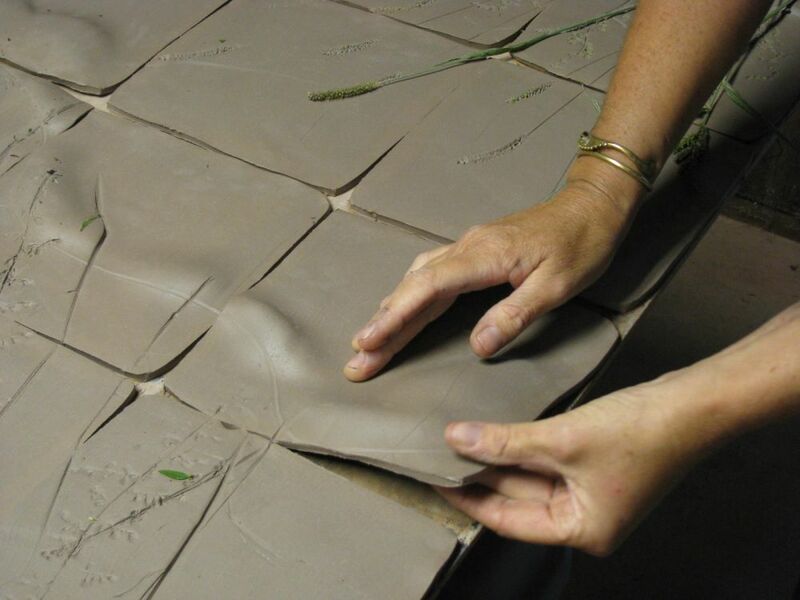 Burnishing aligns the clay particles so the finest clay rises to the surface, creating the satin finish you see. Once the pieces come through the first (bisque) firing, they are prepared for the saggar firing. In this process, each vessel is wrapped with organic materials, including sawdust, grasses, rope & wire. The wrapped pot is put in a ceramic chamber inside my gas kiln (that is the saggar) and fired to 1900-degrees for about 6 hours. The kiln cools overnight. Each piece is rinsed clean, set to dry and waxed with a carnuba/beeswax/citrus oil to bring the natural glow of the piece to the surface. The final step is preparing and attaching the wooden handle, if the piece has one. 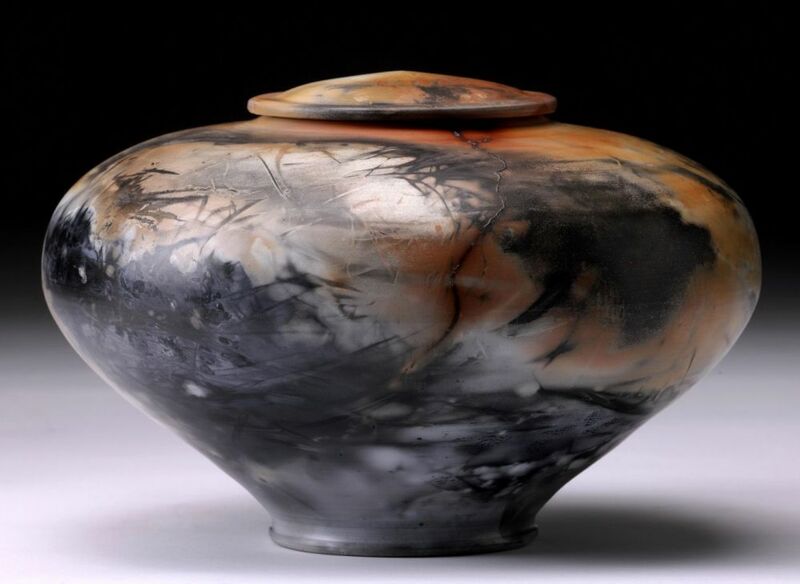 Start the finish, the creation of each saggar fired porcelain vessel takes about 3 weeks. Do your vessels hold water? Answer: No. 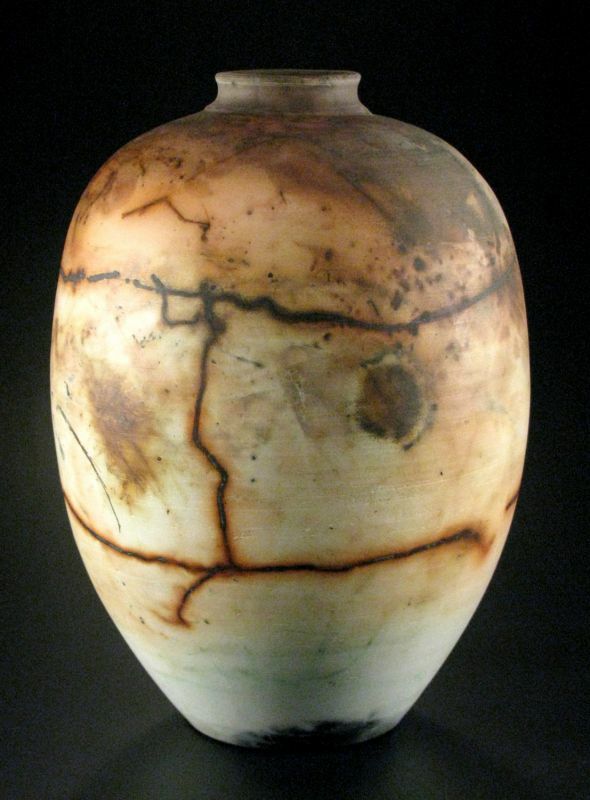 The unusual surface you see on my saggar fired vessels appears because there is NO GLAZE on the work. Glaze acts as a sealant to clay. Since my vessels are unglazed, like a terra cotta flower pot, they are porous and if filled with water, it would seep out over time. My vessels can hold any material that is dry or packaged in another packing. How are the handles made? Answer: All my handles are cut from natural wood including curly willow, wild grapevine, bamboo & contorted filbert to name a few. Each wood handle is treated with a penetrating and sealing oil to ensure they last. If you have ever seen my work, you know that lifting the lid provides a delightful surprise. 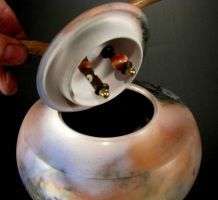 My handles are attached beneath the lid with a mechanical connection, using glass, wood and metal beads along with contemporary mechanics. It is both a work of function as well as a work of art! My intention is that my handles have integrity and also show a love of attention to detail and a penchant for surprise! Do I have to do anything special to maintain my Saggar Vessel? Answer: It is easy to keep your saggar fired vessel clean and satiny. Simply dusting it with a dry cloth or if you feel the finish is getting dull, buff it vigorously with that cloth. There are 2 to 4 layers of beeswax on the surface of each piece. When you buff it, the wax gets re-invigorated and shines up nicely. Remember, do not use water. 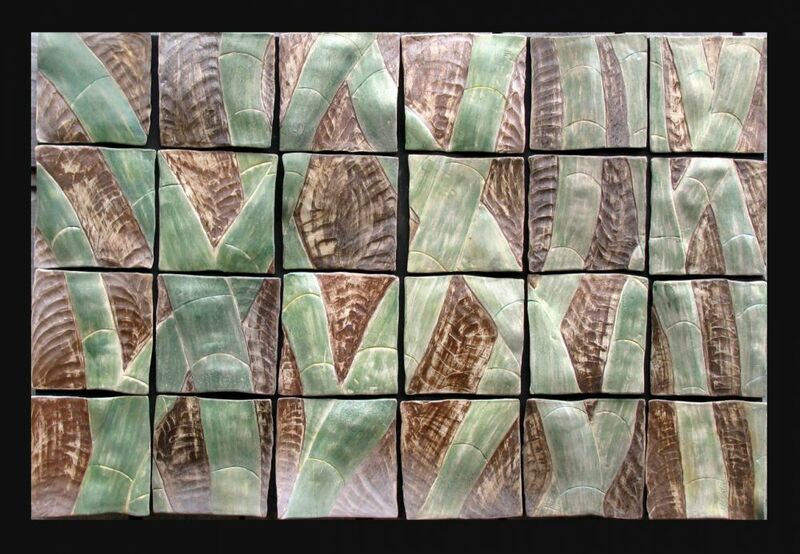 These pieces are unglazed they do not hold water and often water will stain the surface. Is it safe to ship vessles? Answer: YES. 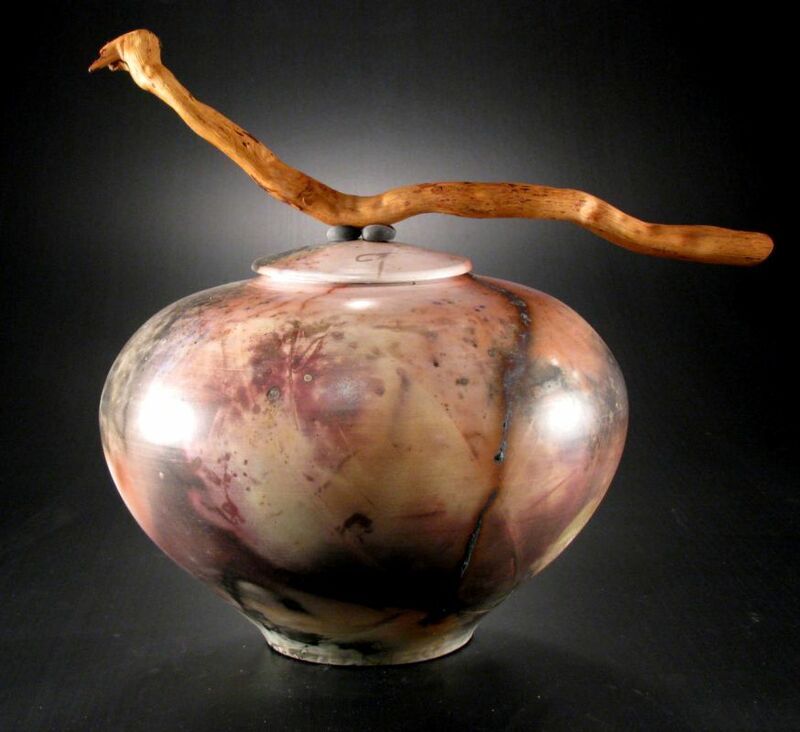 I have been shipping my saggar fired vessels across the country for more than 15 years; I have even shipped them to Thailand! I pack all my vessels in bubble wrap and double box them to ensure they arrive safely. Most of my shipping occurs UPS ground. If you live in the Virgin Islands or Hawaii, I will ship your work via USPS, but always double boxed. 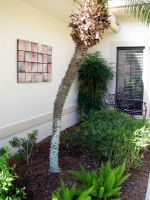 All work is fully insured, so if there IS a problem, it will be covered. How do the Wall Murals Hang? Answer: Each wall mural is designed to hang with a cleat system. A cleat, with a 45-degree angle is built into the back of your wall mural. Another cleat with a 45-degree angle arrives with your artwork - along with hanging instructions. It's very easy. Once you decide where to hang your new mural, you screw the spare cleat (or mounting board) onto the wall with the 45-degree angle facing up. 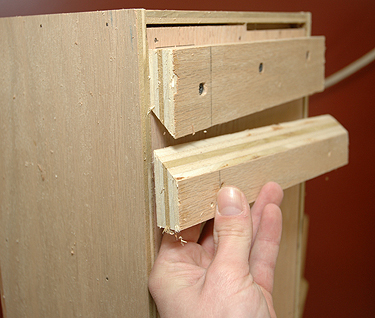 Level it and put your remaining screws directly into your studs. You will see the two 45-degree angles will lock in place, providing a strong, safe and weight bearing hanging system. See the photo provided. If you purchased a wall mural and did not receive hanging instructions, just email me and I will send them to you. How does the french cleat work? Answer: Great Question. It is two interlocking 45-degree angle mounting boards that lock together. One of those mounting boards is permanently attached to the back of your wall mural. The other arrives with your wall mural and must get attached to your wall. Simply place the cleat angle side up and toward the wall right where you want to hang your new artwork (make sure you measure how far down the cleat is placed on the back of your work). Put one screw into the cleat (this screw tacs the cleat in place, it is not attached to a stud). Find your studs and mark them on your cleat. A stud finder is the best way to find your wood or metal studs. Level your mounting board and put your second screw into the first stud you found. Check again to make sure you're level. Put screws into each additional stud, making sure your cleat remains level. Now you're ready to hang your artwork. Lift the wall mural so it is 2" above the wall cleat and slide it down. The wall cleat will catch the cleat on the back of your artwork - and you are done! 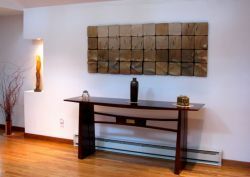 If your mural comes in several sections, hang the last section with the wood overlap FIRST, then hang the next section. 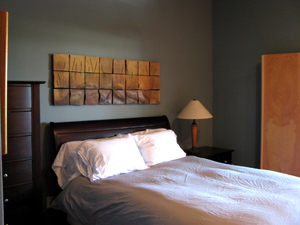 Once on the wall, you can adjust your mural to the left or right as desired. Here's a video that provides some great visuals. How heavy are the wall murals? Answer: Each mural has a different weight, but since they are made of clay, they are heavier than a painting. The cleat hanging system holds upwards of 400 lbs of weight and is designed to distribute the weight of your wall mural across several studs, so your whole home is holding your artwork up, not just your sheet-rock. Depending on the size of the piece, wall murals weigh anywhere from 15 to 50 lbs. Larger murals are created in sections, not larger than 35" x 28", the seam to the sections disappears with this hanging system. Contractors and engineers us the 'french cleat' most commonly to hang heavy mirrors and cabinets. Do I need special walls to hang a Wall Mural? Answer: No special walls are needed. Wall murals are designed to hang indoors or outdoors on any surface. 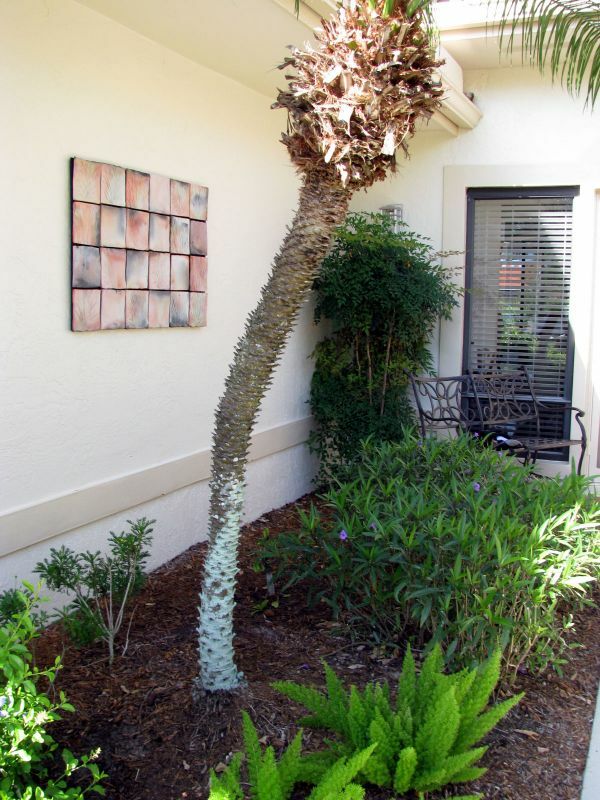 They can safely hang on sheet-rock, plaster, masonry and wood walls. The hanging application for masonry & brick requires using tapcon screws, all other walls require sheetrock or metal screws, depending on your wall's studs. Every hanging application uses a french cleat. Do you provide hanging instructions if shipped? Answer: Yes. All wall murals are built in sections. So if your mural is larger than 28" wide, it will most likely come in two sections. Your mural will arrive with all sections, a cleat to attach to your wall and full instructions on how to hang it. Hanging your wall mural is easier than you think! What if I love a piece on your website, but it's the wrong size or color? Answer: No problem. You can commission me to create a wall mural that is perfectly sized and just the right colors for your home. Commissions are a wonderful way to become an intimate part of the creative process. When I do commissions, once we've gone over all the details, I create 2 to 3 pieces for you to choose the perfect wall mural. Answer: Commissions are a great way to help design that perfect piece of artwork for your home. Before there is any commitment, Commissions always begin with a discussion of what you're looking for, colors you're drawn to and of course, size that works. It is as much or as little of a collaborative process as you make it. Once I know what you would like to see, I will design several options for you to choose. When your design is selected, I will create an estimate for the artwork. Once pricing is established & the design is approved, a one-third down payment is required. At this time, the commission is official and will begin. During the creation of your wall mural, I photograph the development of it & publish it on my blog so you can see it being created virtually. At any point I encourage input, but at critical stages I discuss my next step, to ensure we're both on the same page. The second 1/3 payment is submitted at the halfway point of the commission. For every commission, I create 2 options. 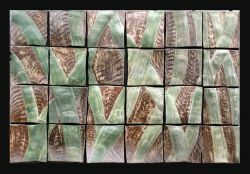 Once both pieces are fired, you have a choice which one works best in your home. The selected piece is either delivered & installed or shipped with installation instructions, at that point the final payment is rendered. Commissions take much more time and input, but do not cost that much more. The price is all inclusive with conversations, samples, photos, changes, and whatever else is needed. I charge a nominal 'commission fee' for the intimacy of the experience & the photo evolution of the work. Depending on your project, a $200-$300 commission fee is added to the retail price of the work. Clients are, however, exempt from sales tax, so the actual 'additional cost' is closer to $75-$100. 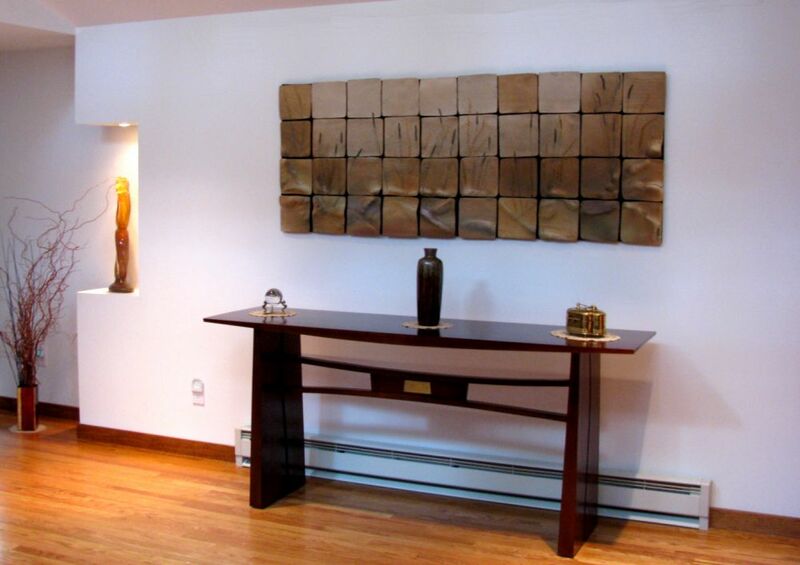 Want to begin a discussion about a commission for your home or office? Email me! What happens if my vessel or mural arrives broken? Answer: All my work is fully insured when shipped out. I have been working with UPS for 15 years and I am very familiar with their shipping requirements and my needs. The work is always insured for its full retail value. I have shipped work to Thailand, I can certainly ship it safely to you! Having said that, if for some reason your artwork arrives damaged, simply hold onto all the packaging, call me and I will walk you through the process from there. You will get a full refund for the artwork or I can create another piece for you, it will be your choice. I promise you will not be held responsible for work that broke in transit. Where can I hang my wall mural? Do you have payment options other than paypal? Answer: Yes. Many people are not comfortable with paypal. If that's the case, you can send me a check and when I receive it I will ship out your artwork. Or if you prefer, you can give me your credit card information over the phone and I'll process it through my private credit processing system. Many people have asked me about payment plans. The best payment plan is an auto-pay on your credit card. I can easily set up monthly or quarterly payments to your card, you don't have to think about it, the money is automatically pulled out and this allows you to payoff your artwork over time. Just email me and we can talk about alternative payment options.